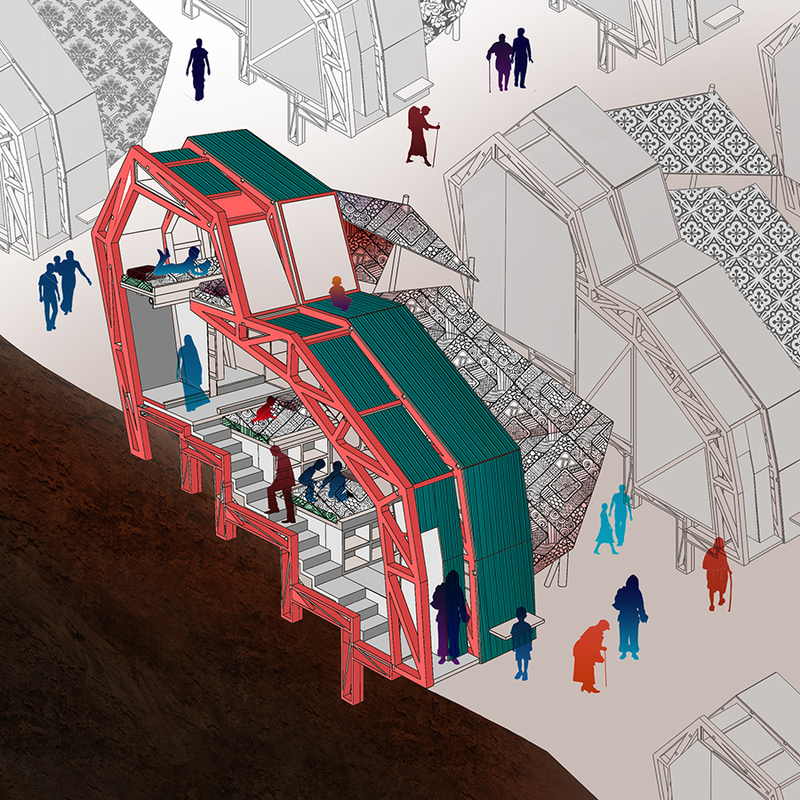 This One-room Dwelling Architecture (ODA) is a design exercise dedicated to the victims of the Rohingya genocide in Myanmar. This illustration is inspired from three drawings by Rohingya children depicting the atrocities, scenes of genocide, beheading, dismembered body parts, arson, etc., as entire villages are destroyed by Myanmar military forces and families and communities are torn apart. The final ODA comes to life through multiple iterations of furniture, fixture and appliance arrangement, as well as reconfiguration of the structural frame and walls. 5. 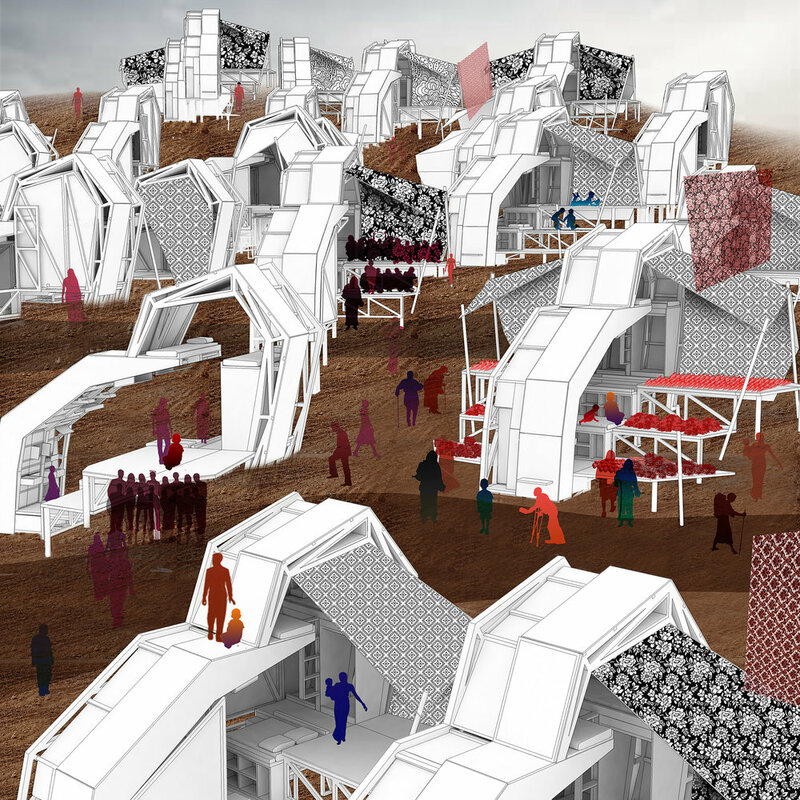 The design adjusting to different stages of refugee settlement, as well as different family/community structures. The different components are also designed such that different donor agencies/corporate entities can mass produce and supply different parts. Design inspiration was also drawn from meaning found in the translation of words characteristic of the refugees from English to Bangla- the Rohingya's native tongue- and back to English. refugees who have set up bamboo, wood and plastic huts. The next stage of transformation of the landscape could be the introduction of the ODAs. This site alone holds over 500,000 refugees and is the largest in Bangladesh. As the Rohingyas move in, they are housed according to their immediate family needs, factorising the number of family members currently present at the camp and those lost, or having the possibility to arrive later. Foundations go into the ground to anchor the homes into the hills, as well as to prevent landslide during the Monsoon season. Different compartments - some opened by rotating, others by pulling down or forward- containing clothes, personal accessories, kitchen and other basic household utilities are provided for the refugees by aid agencies and NGOs. More can be added based on the refugees affordability. Back of the house contains two separate cubicles, one with a squat pan and the other for bathing and washing clothes. An extendable ladder helps children and young adults access beds on the upper level. The front of the house contains an extendable stove, and sink, besides other storage spaces. Renewable energy is available to the inhabitants through the introduction of ‘solar sails’, or fabric fitted with photovoltaic cells. These can be rotated manually to align with the sun path. A variation of the ODA contains an expandable portion, framed by fabric that can be unrolled into roofs and facades, and facades that can open up into plinths, to accommodate for different family sizes or other programs. When the expandable area of the house is not in use or is partially used, the space can be used as a domestic vegetable garden, or play spaces depending on the topology. Fabric of different patterns are available to the refugees to culturally personalize their homes. The same design can be used as a school, shop, place of performance, health station, etc. to extend the use of the refugee camp beyond just basic dwelling and provide a better quality of life, even as refugees. Eventually, as the Rohingyas are repatriated, taking along with them parts of the ODA such as the storages, fabric and even the plinths, etc. for their homes back in Myanmar, all that will be left will be the frames of the house, to be ultimately taken over by the forest as the government would come back to replant the area under its existing social forestry program. The marks of the trauma, as well of the ODA and the Rohingyas will have permanently placed themselves onto the site. The forest therefore, will never be the same as it used to be.